The Comic Code’s hangover was a long one. From the beginning of the 20th century educators, scholars, and many self-proclaimed “protectors of the youth” denigrated comics (books and newspaper strips) as being, at best, a waste of time and at worse, the cause of juvenile delinquency, bad grades and, I think, vampirism. The congressional hearings and threats of banning comic books in the mid-1950s didn’t help. So many people grew up in this era with bad feelings towards comics because that is what they were taught. And while comic books were not just for young readers before 1955, after the Comics Code was established in that year, they mostly were. 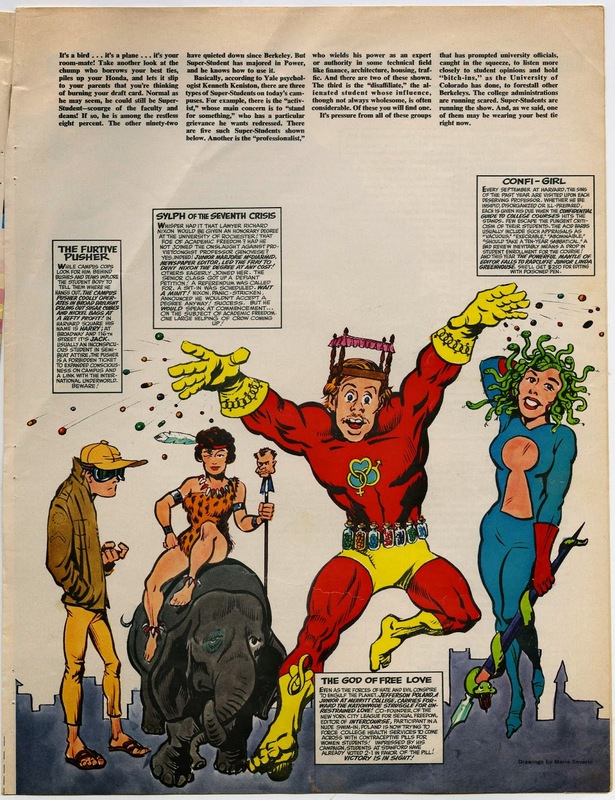 Julius Swartz and Carmine Infantino both told me that “comics were for 12 year olds.” Well, in the 1960s, their comics were. The Superman TV show as on the air before all this happened in the 1950s, but no new show, based on a comic book super-hero, was to follow until Batman, almost a decade and a half later. Even Hollywood was scared off. 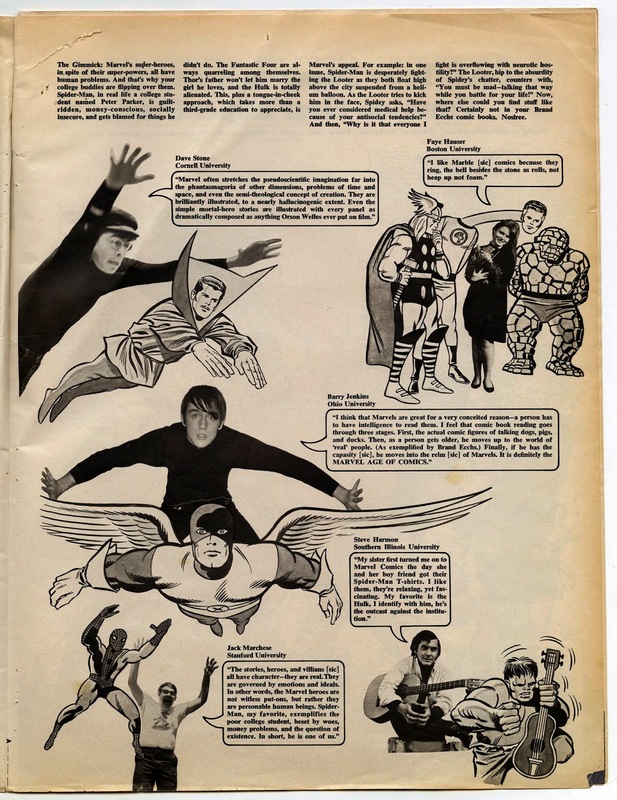 Movies and serials based on comic book characters had been very popular in the 1940s. 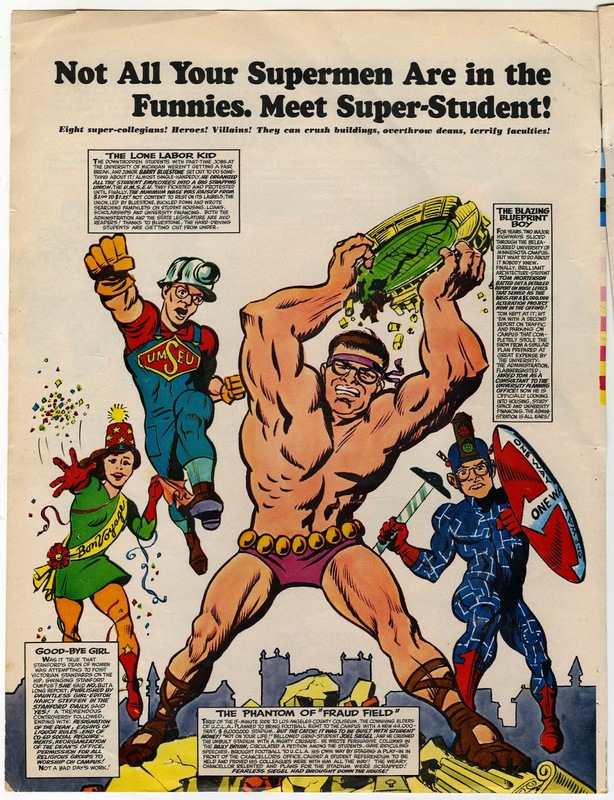 Stan Lee obviously enjoyed the fact that Marvel comics were becoming popular on college campuses and he made personal appearances at many of them. Slowly, comics were being welcomed back into the world of popular culture, if not popular fiction. 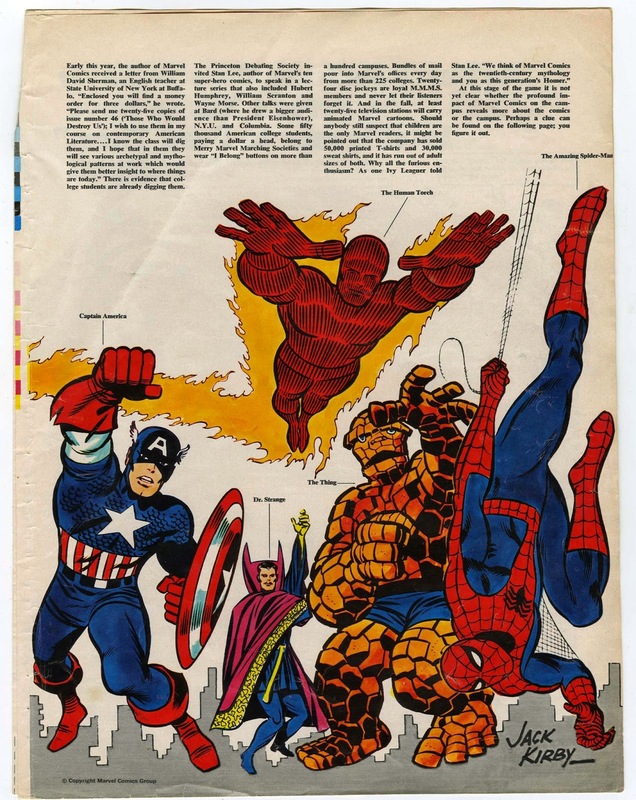 At first it wasn't the big city newspapers and TV shows that presented favorable and colorful stories about comics, it was the sophisticated, young adult publications that included the Village Voice (1965) and Esquire (Sept. 1966) that helped bring Marvel Comics to the attention of young adult readers. 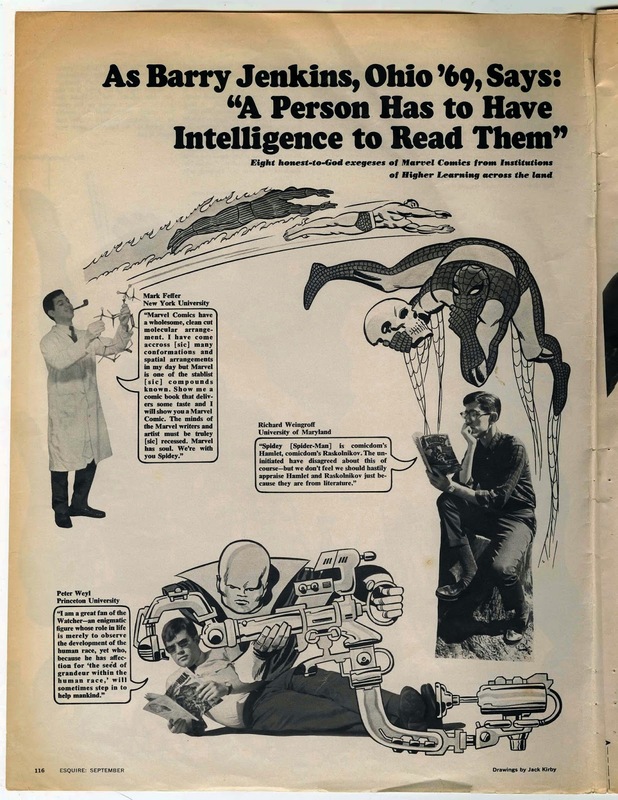 The copy reads: Early this year, the author of Marvel Comics received a letter from William David Sherman, an English teacher at State University of New York at Buffalo. "Enclosed you will find a money order for three dollars," he wrote. "Please send me twenty-five copies of issue number 46 (`Those Who Would Destroy Us'); I wish to use them in my course on contemporary American Literature....I know the class will dig them, and I hope that in them they will see various archetypal and mytho­logical patterns at work which would give them better insight to where things are today." There is evidence that college students are already digging them. The Princeton Debating Society invited Stan Lee, author of Marvel's ten super-hero comics, to speak in a lecture series that also included Hubert Humphrey, William Scranton and Wayne Morse. Other talks were given at Bard (where he drew a bigger audience than President Eisenhower), N.Y.U. and Columbia. Some fifty thousand American college students, paying a dollar a head, belong to Merry Marvel Marching Societies and wear "I Belong" buttons on more than a hundred campuses. Bundles of mail pour into Marvel's offices every day from more than 225 colleges. Twenty-four disc jockeys are loyal M.M.M.S. members and never let their listeners forget it. And in the fall, at least twenty-five television stations will carry animated Marvel cartoons. Should anybody still suspect that children are the only Marvel readers, it might be pointed out that the company has sold 50,000 printed T-shirts and 30,000 sweat shirts, and it has run out of adult sizes of both. Why all the furious enthusiasm? As one Ivy Leaguer told Stan Lee. "We think of Marvel Comics as the twentieth-century mythology and you as this generation's Homer." 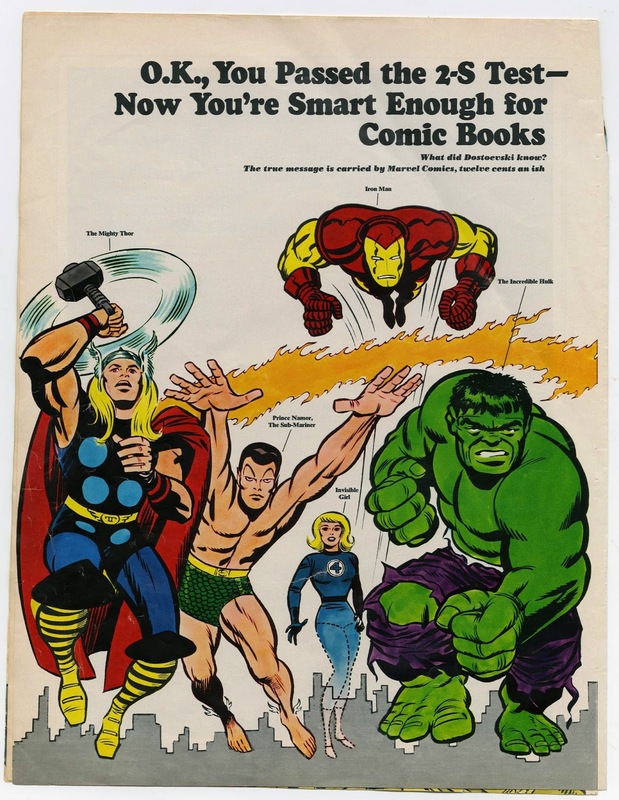 At this stage of the game it is not yet clear whether the profound impact of Marvel Comics on the campus reveals more about the comics or the campus. Perhaps a clue can be found on the following page; you figure it out. 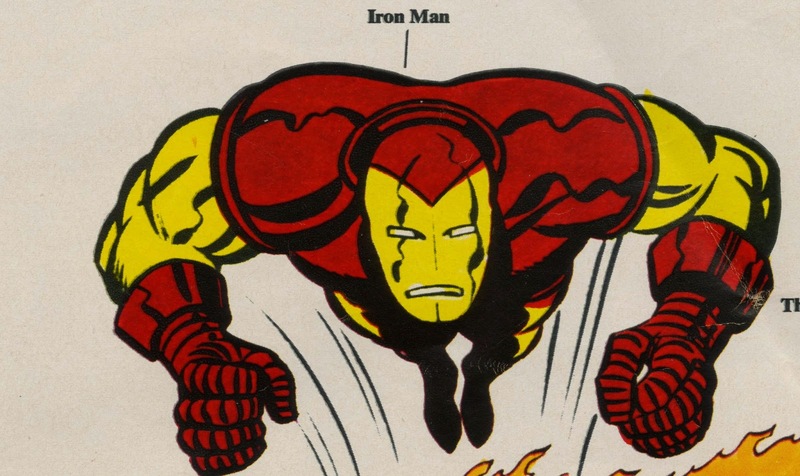 The Gimmick: Marvel's super-heroes, in spite of their super-powers, all have human problems. And that's why your college buddies are flipping over them. Spider-Man, in real life a college student named Peter Parker, is guilt-ridden, money-conscious, socially insecure, and gets blamed for things he didn't do. The Fantastic Four are always quarreling among themselves. Thor's father won't let him marry the girl he loves, and the Hulk is totally alienated. This, plus a tongue-in-cheek approach, which takes more than a third-grade education to appreciate, is Marvel's appeal. For example: in one issue, Spider-Man is desperately fighting the Looter as they both float high above the city suspended from a helium balloon. As the Looter fries to kick him in the face, Spidey asks, "Have you ever considered medical help because of your antisocial tendencies?" And then, "Why is it that everyone I fight is overflowing with neurotic hostility?" The Looter, hip to the absurdity of Spidey's chatter, counters with, "You must be mad—talking that way while you battle for your life!" Now, where else could you find stuff like that? Certainly not in your Brand Ecchs comic books. Nosiree. 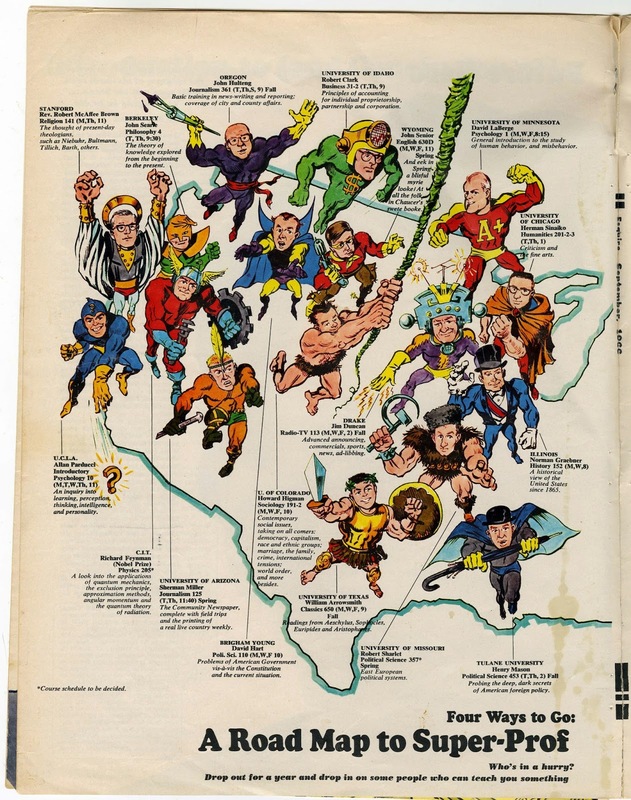 Actually, there were a lot of entertaining comics for 12 year olds that adults could also enjoy. I wonder if the decline in circulation of comicbooks over the last few years is linked to them now being aimed mainly at adults. Jeez, Barry, you know my mind's like half-gone. 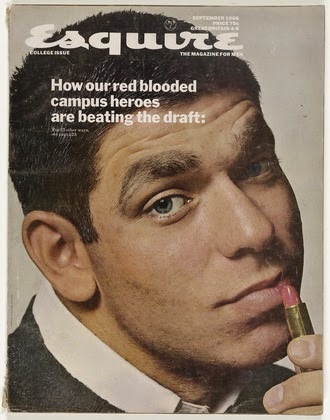 Somewhere -- maybe in Sean Howe's book -- there was a write-up on the Esquire piece came to be, and it wasn't pretty. Also, I presume if you did this, you'll be doing a post on Kirby's Jack Ruby story? Kid, I think you are right about comic book sales. They, at least in the states, are not as readily available to young readers as they were when I was 12. And Sed, thanks for the idea of a new post. Just picked this up last month for $30... Fantastic write-up. Hi Barry - I am a mate of William Sherman - he says it's great to see his Esquire thing from way back then picked up. He feels privileged to have made a contribution to the zeitgeist of Stan Lee ... he'd like to tell you more... shall I put you two in touch? Please do and thanx Jim. That would be great!@! !